Yup, it's that time of the week again in which you get to read about yet another award handed out by a member of the Grand Ducal Family. Sometimes it feels like the late fall and winter months are all about that in Luxembourg. Today, it was time for the Hereditary Grand Duke to carry out his award-giving duty. On and off since 1992, the Fondation Kannerschlass has annually given out the Prix Janus Korczak which recognises special achievements in the social sector. This year's award goes to the Association nationale des Victimes de la Route (ASBL), which in line with its name supports victims of road accidents and their families. They offer a wide range of help starting with psychological and social support through to administrative support. The ASBL also tries to do prevention work by educating young drivers for example. 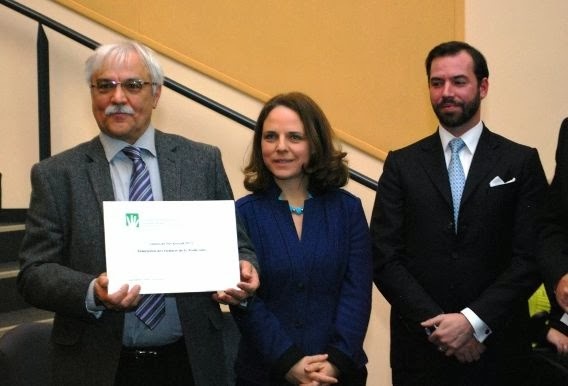 Also honoured, though apparently not with a special award, was the Action Luxembourg Ouvert et Solidaire – Ligue des Droits de l’Homme (ALOS-LDH) for their human rights work. Since 2003, Hereditary Grand Duke Guillaume has been the patron of the Association nationale des Victimes de la Route. His uncle Prince Guillaume and aunt Princess Sibilla, who survived a horrible car accident in 2000, are honorary members of the association and have attended many of their events in the past. First pictures can be found at MyWort. I'm not sure what that has to do with Grand Duchess Elisabeth's bracelets. I think she looks great for a woman of her age, but everyone sees things differently.